On Vasundhara Raje's reported claim that she would fight for the people of the state like a lioness, Sachin Pilot said that though she was a lioness, her biggest hunt was farmers. 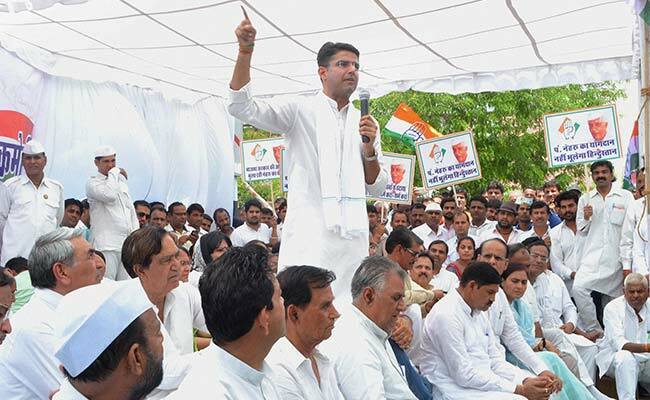 Rajasthan Congress chief Sachin Pilot on Tuesday alleged that the farmers in the state were dying but Chief Minister Vasundhara Raje was busy in her 'Gaurav Yatra'. Mr Pilot was addressing a public meeting in Sangod town of Kota district, held on the occasion of Gandhi Jayanti. On Ms Raje's reported claim that she would fight for the people of the state like a lioness, Mr Pilot said that though she was a lioness, her biggest hunt was farmers. The 'moong daal' is being sold Rs 125 per kilogram, the prices of diesel and petrol are skyrocketing, and the farmers were not able to sell their crop at the government-support price, he said. The Congress leader retorted to Ms Raje calling him a novice and referred to the party's victory in the Ajmer by-elections. The 41-year-old acknowledged that he certainly had to learn a lot, but in politics, he would give Ms Raje such a defeat in the upcoming assembly elections that she would not be able forget it for a long time. Mr Pilot asked the public to question the chief minister if she had ever been able to sleep soundly at night ever since he became the state party chief. "We have at several times in the past four-and-a-half years forced the BJP's state and central governments to kneel down before the pressure by the Congress in the interest of the public," he claimed. The state Congress chief also quipped at the perceived differences between Ms Raje and BJP chief Amit Shah. Mr Pilot said Ms Raje had got no time to look at into the hut of the poor and said the CM was very busy as she has to "defend those who illegally-occupied government lands and to allot the mines to her near and dear ones". He added that Ms Raje lost a golden opportunity regarding development and progress of the state as her party was in power in the Centre too.